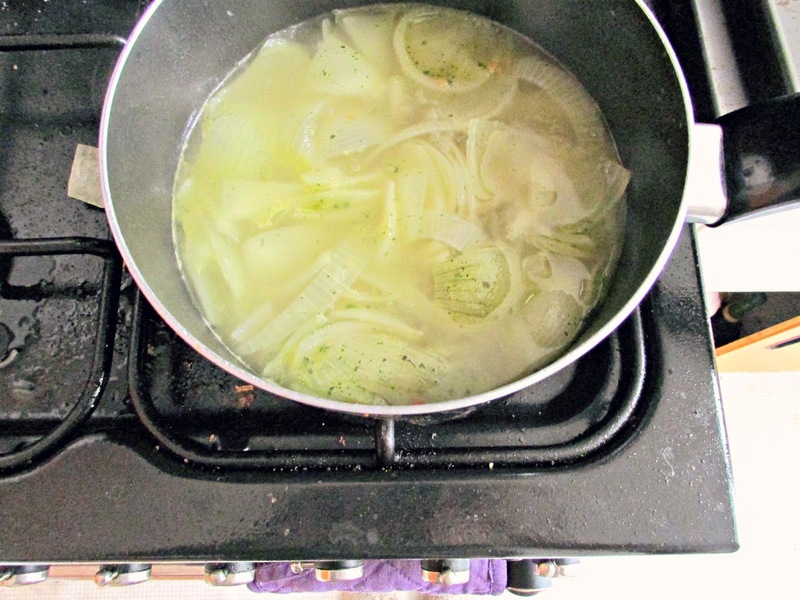 I had never made onion soup before, and then thanks to having lots of onions to use up I thought 'how hard can it be?' and I was right! I really hate following recipes 'cos they never have totally basic ingredients, no matter how 'basic' it says it is! My thrown together easy as pie onion soup recipe is honestly the most ridiculously easy thing ever. Slice the onions up real nice, small, but not too small, you want them to still be blendable. Also chop up some garlic, however much you want. Pop all this into the pan with some butter and turn up the heat, middling heat, high heat, you'll figure it out. Stir it about and cook until the onions are soft, don't let them get too brown or the soup will be bitter! Add more butter if needed. While doing this boil the kettle so the water is ready. Pour the boiling water into the pan, guess how much, until the pan is nearly full I guess! Add the two stock cubes and a lorra lorra salt. Turn up the heat until it boils, then turn it down to a simmer and leave with the lid on for about ten minutes. After ten minutes turn off the heat and let it cool a bit before chucking all of that into the blender. Yes. All of it. Dip cheesy toast in soup and muuuunch. Never tried making this at home. Thanks for the recipe!! Basic recipes are where it's at!